Betway is the leading provider of online sports betting entertainment in Uganda. With our easy-to-use and simple online and mobile betting platform, sports fans from across the country can bet on every sport, across major league and tournament across the world. Click here to place a bet on soccer. If you’re looking to place a bet on any of the world’s most popular sports, Betway is right for you. We provide a range of bet types and markets and competitive odds across sports like football, cricket, rugby, tennis, basketball, baseball and so many more. Football is the most popular sport across Uganda and likewise, it’s the most popular sport at Betway. It’s why we pride ourselves on offering a complete range of betting fixtures, whether you’re a fan of local or international games. So whether you’re interested in placing a bet on local Ugandan teams in the Azam Premier League or you would rather place your bets on the best in the world in the Champions League, Betway is the place for you. Join Betway today for an incredibly entertaining journey as you experience the love of the game. With Betway, you can choose to bet through your mobile device or online at your PC. Our website is easy-to-navigate and easy to use – designed to make sports betting as quick and simple as possible. 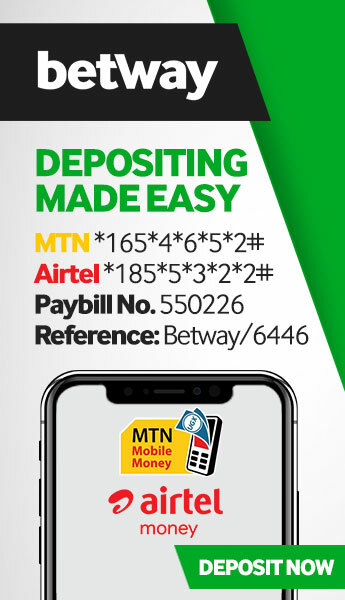 In just a few clicks, you will be able to make a deposit using Mobile Money, select your preferred sport, bet on it and stand to win big! Score with out latest promotions by clicking here. Betway often runs weekly promotions where any bets you place on required games will earn you an entry into a weekly draw. In the past we’ve given away airtime, smartphones, tablets, boda boda’s and much, much more. There have even been times where customers have won once-in-a-lifetime trips to the United Kingdom to watch English Premier League football live! 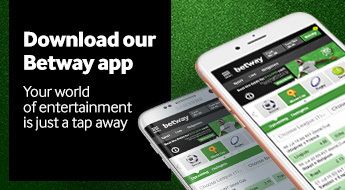 Click here to find out how to download the Betway app on your mobile device. If you want to take a break from sports betting, you can enjoy the variety of casino games on offer at the Betway Casino. Betway offers a unique collection of games that are playable on both mobile and PC. These enjoyable games are packed with bonus features and provide hours of entertainment. You can choose between our classic 3-reel fruit slots or our action-packed 5-reel video slots. You can also spin the roulette wheel or if you’re looking for a more challenging experience you can try any of our blackjack games. Find out about Betway rewards by clicking here. We offer tailored and in-depth customer service for our customers between 7:30am and 9:00pm, every day. Do you have any questions? contact us and we will do out best to assist you. Click here to read out betting rules and tips. Betway is licensed and regulated in Uganda and commits itself as a supporter of responsible gambling. Rest assured, all transactions online with us are protected using state-of-the-art digital encryption technology, creating a safe and regulated arena in which to comfortably bet from anywhere, at any time. Are you ready to start betting? Click here to get started.